← Constitutional and International Legal Issues — Trump’s Foreign Policy. What passes as conventional knowledge and received wisdom in the Trump administration (better known as ‘Trump Think’ in Trumpland) concerning U.S.-China trade relations and the WTO (and particularly its dispute resolution system)? Simply put it is two-fold – China has taken advantage of its WTO membership since its accession in 2001 and, in particular, it is useless to rely upon the WTO’s dispute resolution process to resolve disputes. This is because, according to Trump Think, everyone knows — China never observes the rules of global trade nor decisions of the WTO. What the facts are concerning China and litigation in the WTO with a focus on the U.S. I want to start and end with the very short history of WTO litigation during the Trump administration. Three salient facts jump out. One. The Trump administration never filed a case during its first year. It only belatedly filed one against China (concerning intellectual property rights) as part of its onslaught in spring 2018 to force China’s capitulation to its broad trade and investment demands. Two. China responded to Trump’s trade demands by filing its own two cases against the United States. The first concerning the U.S. reliance on §301 unilateral retaliation to impose restrictions on a range of Chinese products because of alleged China’s violations of intellectual property rights. The second concerning U.S. reliance on §232 national security to impose restrictions on steel and aluminum imports from China. Three. 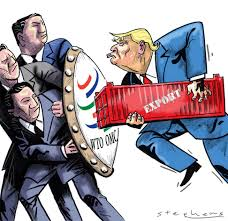 The recent action by the United States in the dispute resolution system is in the broader context of the Trump administration’s public disdain of the WTO and, in particular, its dispute resolution system. The Trump administration argues that system is a gravely flawed legal process that works against U.S. national interests. One additional intervening event occurred and should be noted. The WTO issued a compliance report concerning a prior case brought by China against the United States. It found that the United States was not incompliance with prior recommendations concerning state owned enterprises are not necessarily a ‘public body’ for the determination of government subsidies. The U.S. is appealing this panel compliance decisions. What can be surmised from the above? Despite the Trump administrations’ disdain for the WTO’s dispute resolution systems it is now participating somewhat in it, finally. This is a good development.